When in trouble nowadays, help always comes with a price. 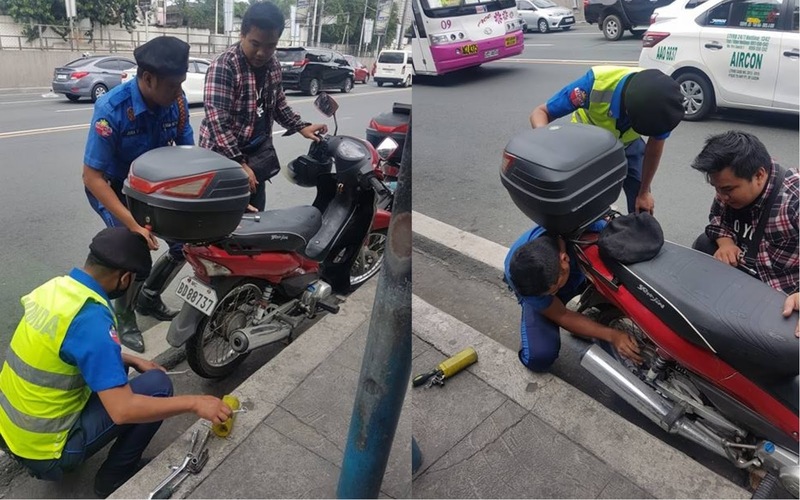 But not on this occasion when Netizen Jaya Lupaz had trouble with his motorbike at Magallanes MRT Station, two Metro Manila Development Authority (MMDA) traffic officers gave a helping hand. Lupaz narrated that they got a flat tire in the middle of EDSA near the MRT station of Magallanes Avenue when two officers came to their aid. Considering how far the vulcanizing shop is, the officers offered to take the flattened wheel to the shop instead. The netizen was so happy for the help that the MMDA officers provided and at the same time shocked because they didn’t ask for anything in return. “Filipinos are truly amazing for their hospitality. They helped out and never asked anything in return,” Lupaz stated. Filipinos like these are truly remarkable, just two souls full of goodness, helping those in need. May we all become like them and live happily with each other. “We would like to thank these MMDA officers for helping us out even though it's not part of their job. Naflatan kami sa gitna mismo ng EDSA near Magallanes station ng mrt and bus stop. Napakalayo ng vulcanizing shop so nag offer sila na baklasin yung likod na gulong tas dalhin sa shop. Filipinos are truly amazing for their hospitality.